How To Re-Purpose A Pillow On A Budget! You are here: Home / DIY / How To Re-Purpose A Pillow On A Budget! 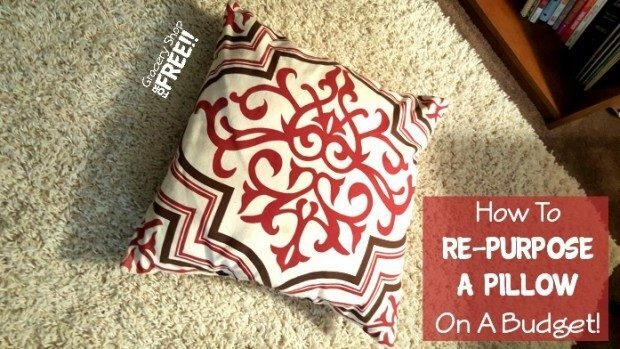 T is back with another fun DIY project: Re-purposing a pillow on a tight budget! You know how you go shopping and you find fabric remnants? You can purchase those remnants for pennies! I love to grab little scraps of fabric and play around with them. One thing I like to do is recover pillows. I have some old pillows that were on a couch that I loved but they have been through the ringer. I want to do a makeover in my bedroom and I figure these pillow will be super cute as throws. I found some beautiful fabric but this fabric was not cheap. I need to stretch this fabric from pillows, comforter accessories, and tie backs for curtains. If I do this correctly, I can probably recover a lamp or two as well. I love a challenge. Grab a nice selection of fabric. Lay the fabric with the dull side facing upward. Sew the fabric to the pillow. Leave one side of the pillow completely or partially open so you can flip the pillow in the end. The back will still reveal an ugly throw pillow. Now it is time to turn the pillow inside out. Simply stick your hand in and pull the sewn pillow through. Voila! You have a re-purposed pillow and you used half the fabric! Wow, nice tutorial! I’ll have to try that as I have a bunch of old ugly pillows! Thank you!